"Emptiness is not really empty; Emptiness is full of everything. The 'everything' just isn't manifest." 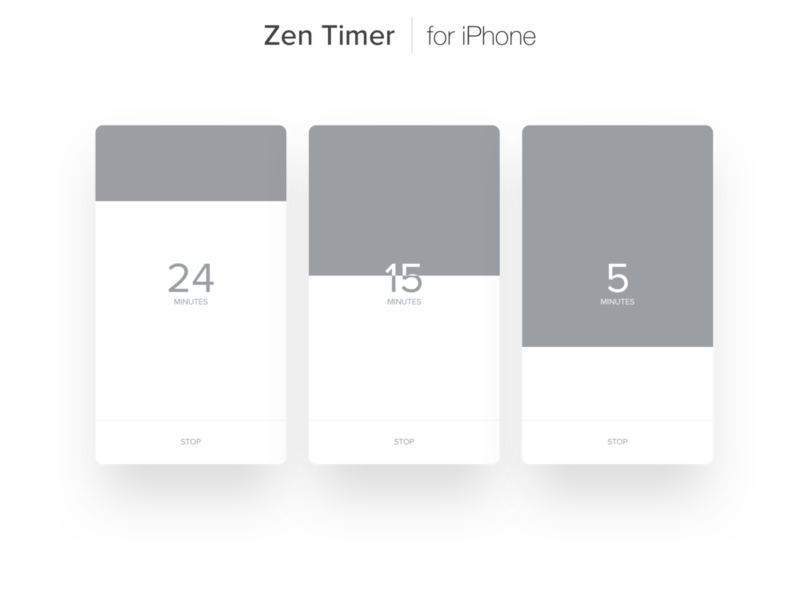 Zen Timer is a meditation timer I designed as I was getting into Zen philosophy and meditation. I felt most of the meditation timers in the app store were either too full-featured or poorly designed, so I designed my own. It's really simple. You open the app and tap "Start" to start the meditation. The screen then goes from "full" to "empty" over the course of your meditation, finally arriving at full emptiness (!) and revealing a quote so that you get a little surprise when you open your eyes. It was intentional that the start and end states are dark grey - I didn't want to use all white at those times since meditation environments are often dimly lit, and a bright white light would be offensive. A feature I'd like to add is a little button that lets you track progress, but when you tap it, it just scolds you for thinking that meditation is a way to make progress (as if there is somewhere else to go but here). I felt this kind of humor is at the core of Zen as I understand it.